As a lover of apples and a hater of cider, I have often wondered why somebody can’t just make an apple beer!? Then I chanced upon Unibroue Ephemere (5.5%ABV), a candy-cane sweet Belgian style apple ale last October and found that I was right – apples can make a good beer! Unfortunately this was over in Vancouver and the brewery is in Quebec so there’s little chance of finding it over in the UK. 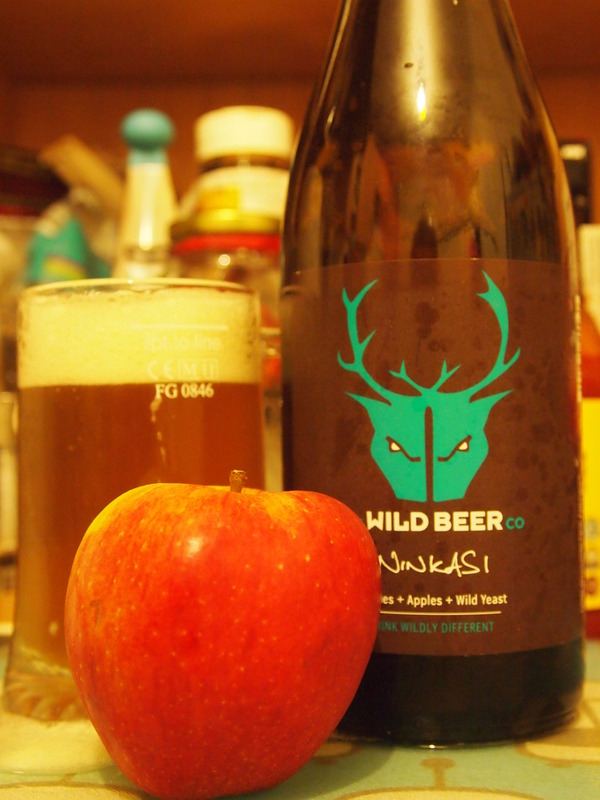 I’d almost lost hope on another apple ale until I spotted the Wild Beer Co‘s Ninkasi,(9%ABV) a very strange beast named after the ancient Greek goddess of beer. It’s a Belgian-style saison with New Zealand hops, wild yeast and Someset apple juice. If this all sounds rather zingy for you, be warned that champagne yeast is added at secondary fermentation to take the effervescent bubbles up to the next level. Whilst I love a pretty bottle and noticed this one partly due to it’s striking appearance, I soon realized it may not have been a good idea after all. The regular metal lid was coated in wax which had been elegantly allowed to drip down the sides but there’s just one issue with this. When the wax is solid and the beer inside is potentially pretty lively, wrestling with a tough seal is a fast-track to a very beery kitchen. Eventually we ran a sharp knife around the edge and then held our breaths in anticipation as the OH gallantly prized open the lid. Thankfully disaster had been avoided. Now the main challenge was in pouring the damned thing using the good old ‘pour half an inch then wait for the head to top the glass then subside’ method. But what a sensational saison. They were right about the bubbles! The rustic aroma has a hint of the apples and the taste is so unbelievably crisp and dry you can almost taste the crunch – there’s definitely a hint of champagne-ness. It doesn’t have the typical flavor one would expect from New Zealand hops; there’s a lot of bitterness and a hint of citrus but the tart apple is the star of the show here. It”s a world away from the candy apple Unibroue Ephemere which makes me wonder where else brewers can go with delicious apples. I really loved this, but although I say loved it’s not so bad as I have another bottle. Hope they brew this again, delicious.